Guide to decoupage product brands. There are a few big names in the world of decoupage but don't over look some of the smaller brands. There are a lot of great products available. Decopatch is a major producer of decoupage supplies from papers and brushes through to extra large decopatch blanks. The Decopatch brand is so well known that the modern style of decoupage is often referred to as decopatch. All the Decopatch products are good quality. Their Decopatch papers are thin, flexible, strong when wet and the colours won't bleed or fade. 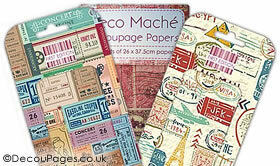 Deco Mache is another brand name that produces a range of decoupage products. They make an excellent range of stylish decoupage papers. The Deco Mache papers are thin, strong and flexible. They can be used to decorate a wide range of surfaces. 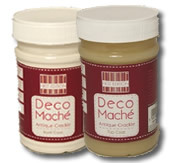 Deco Mache also have a range of glue-varnishes. The varnishes are non-toxic and water resistant. As well as the standard gloss and matt finishes, Deco Mache also supply an antique crackle glaze varnish. The crackle glaze is great for upcycling projects. It is a 2 part system - a base coat and a top coat. The Mod Podge brand is well established and produces a huge array of decoupage related products. They produce many different types of glue, so make sure you select the correct one for your project. Their glue-varnish is a type of polyvinyl acetate all-in-one glue, sealer and finish that is available in matt and gloss finishes. They also have more specialist glue-varnish products including a dishwasher proof gloss, sparkle and extreme glitter glue-varnish. The Mod Podge Fabric glue even allows you to make decoupage style projects with fabrics. There is a whole range of Mod Podge brand decoupage tools including foam brushes, spouncers and brayers. 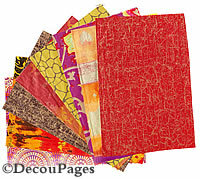 Deco Nouveau and Artepatch are other brand names to look out for when searching for Decopatch papers and supplies. Another new brand to look out for is Annie Sloan. Not a supplier of decopatch papers, but they do have a great range of chalk paints that make an excellent canvas for decoupage. They also supply a glue-varnish and 'gold' or 'silver' leaf for that extra special touch to a project.